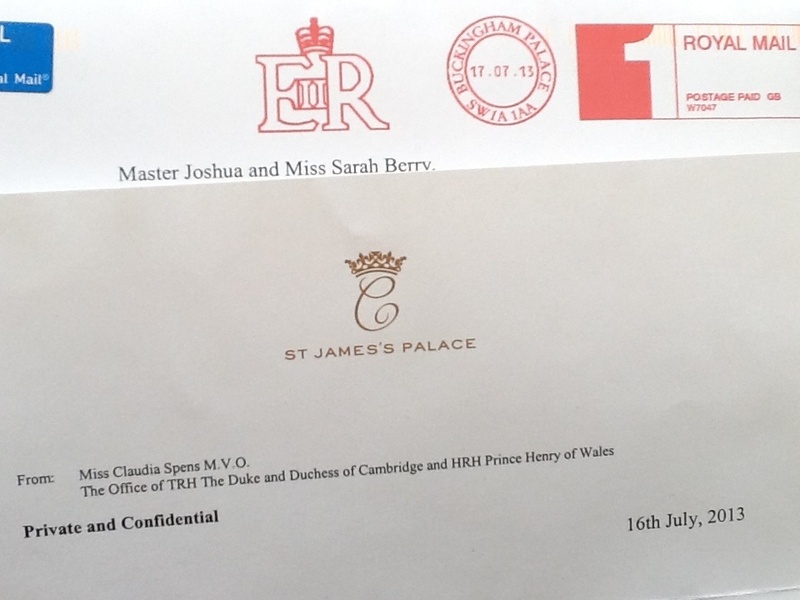 A major highlight this week was the children receiving a letter from the Office of The Royal Highnesses Duke and Duchess of Cambridge (Prince William and Princess Kate), postmarked from Buckingham Palace but written at St. James Palace, London. Several weeks ago, Princess and Matey wrote a letter to Princess Kate and Prince William. It was a prophetic letter where they had asked God to give them something encouraging, something edifying and something comforting for the baby’s future. At this stage, the baby was not yet born. The children were so excited to receive a letter in return thanking them for their kind thoughts. 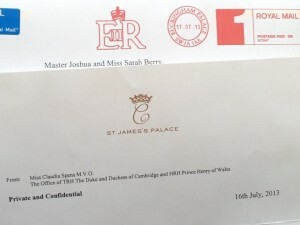 The letter arrived the day before the royal baby was born. Princess Kate is my Princess’s hero and mentor and my Princess loves the royal family. Thus, this was very special. It also encouraged my children to continue to seek God for prophetic words or destiny words for other people and to share it with them. Before we left, we had had three schooldays this week, of which one we only did the bare minimum due to packing and holiday preparation. I consider the life skills the kids learn as just as important in preparing them to be responsible, mature adults. Thus, in preparation for leaving to go on holidays, Princess visited our neighbours to let them know we were going and to ask certain neighbours to collect our mail and to put out our garbage bins whilst we were away. We have an elderly neighbour in the unit behind our place and it was also to inform our other neighbours about this so that they could keep an eye on her, reverse her car in the drive for her etc. Matey and Princess both had to pack their own clothes, books, swimming gear and Cabin baggage. We chat about what to take and how many items of clothing and then they have to get it and pack it. I believe that this is great training. We didn’t pack a lot of cabin baggage this year as it is only a two hour plane flight and the kids are a lot older and can read a book during that time or fill out a Sudoko puzzle or puzzle book, plus eat a snack. Matey wanted to bring a couple of items that sit on his bedside table but have no use other than that. His explanation was that he wanted it to be like home. I had Princess compile a menu for the first week of holidays, making sure to consider everyone’s tastes and preferences, not just her own. From this she was going to make out a shopping list so that my husband could buy the food when we arrived. This saves us so much money in being able to cook in our apartment than eating out. Princess and I were going to compile the shopping list on the plane but unfortunately Princess had a vomiting bug and after vomiting all over herself and me at the beginning of the flight, slept most of the way. Thus, I compiled the list. I believe it is important for my children to learn life skills and grocery shopping and menu planning are part of this. When we travel, Matey (7) is responsible for the bags, along with my husband. Matey delights in helping and has no trouble finding a trolley if needed and getting near the baggage carousel to look for our bags and grab them off. I loved his concern with the empty trolley, and his respect for other people after we had placed the bags in the car. Matey couldn’t find the place where you were meant to leave the trolleys safely. Husband commented to him to just leave it safely on the side of the walkway as someone will come and get it. Matey insisted that there was a proper place to leave it and that he needed to leave it there. I was proud of him for displaying that character trait. We had no sooner ascended into the air on the plane when Princess, who was sitting next to me, vomited all over herself and me. We managed to catch some in the vomit bag but most went all over us, our clothes and the seat. The air stewards were busy serving food so they took awhile to come and help. Thankfully for the man sitting next to me, they managed to find another seat for him to move to. I decided then and there that it was something we couldn’t control but we could control our attitude towards it. Thus, we smiled and made the most of the situation – more room for Princess to spread out and go to sleep. I find that our attitude can make or break a situation and in this situation, even though we had wet, smelly clothes, we chose to still enjoy the flight with Princess sleeping and myself having time to plan a few things and write a blog post. Due to a diarrhoea and vomiting bug that we had picked up, Princess and I didn’t leave the unit for the first few days. Workmen were grinding concrete just below our apartment, thus constant noise during the day began to start to annoy me. Attitude came into play again. I realised I could complain and get worked up about it or I could be thankful that we could holiday here. Thus, I chose to spend time telling God all the things I was thankful for. At the end of that time, I noticed it was quiet. The workmen had gone to lunch so I was able to get some peace. The mornings have been spent on the beach body boarding after taking the scooters to the skate park. I love the amount of outdoor exercise we do on holiday when it is warm and dry. Then back to the pool for swimming. 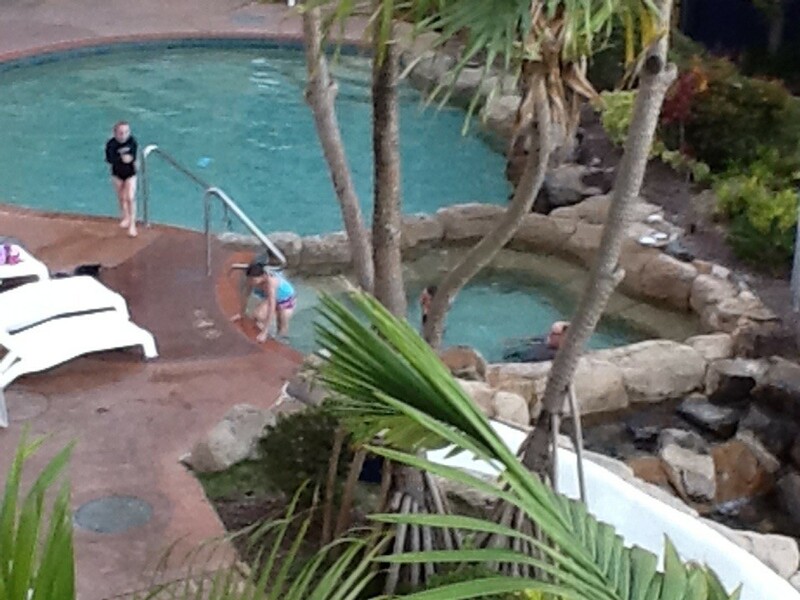 Enjoyed watching Matey in the spa with a group of 4 kids his age. He was enjoying commanding the conversation, asking them all sorts of questions and explaining things to them. It was a pleasure to watch as Matey always seems to have an older sister around who takes charge so, for once, it was his turn. After those kids left, a boy Princess’s age was by himself down there and soon latched on to the kids. It was a great learning experience for Matey as this boy was obviously bored and allowed by his absent parent to do whatever. Thus, I kept a close eye on the boy and Matey. Matey at this stage can be easily led and the testosterone was flying as they both tried to outdo each other. Matey soon became understandably frustrated that this boy would manhandle him and try to take whatever pool toy Matey had off him. Princess had already worked out that this boy was up to no good and had moved away from him. The boy had supposedly already broken the spa emergency stop button and the resort caretakers soon came and took him to his dad. I tried to ascertain what I could have done differently in that situation. I didn’t want to be a ‘helicopter’ parent, hovering around my kids and not letting them make wrong decisions and then learn from them, but I also didn’t want to be oblivious to what I sensed in my spirit. I had already jumped in the pool and played a few games with the kids to distract this boy from being rough. I had asked him to get the plastic table he had thrown in the pool out and place it back where it was. What else could I have done in this situation? We had a great chat with the kids afterwards about not letting other kids lead you to do silly things or things where you don’t show respect to other people or others belongings. I spent some time one afternoon reading to Matey and having him read to me. The day before we had gone to the local library and borrowed a lot of books. This meant that the kids had a new stock of books to read plus Matey could continue practicing his reading to me. Before leaving home, we had purchased a new book about a fugitive slave in America in the 1850’s. 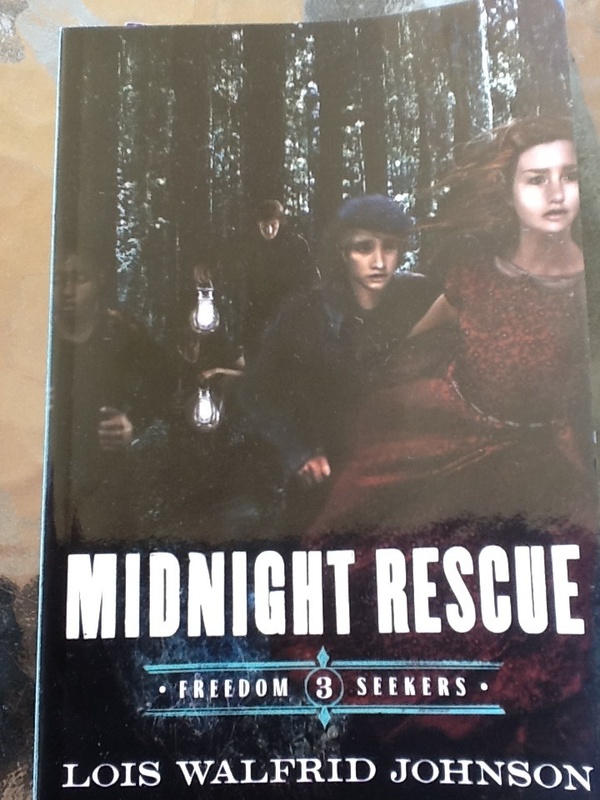 It is a great book full of suspense. Check it out, we are loving it. 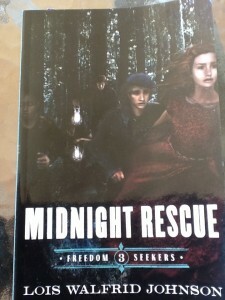 “The Freedom Series” by Lois Walfrid Johnson. We actually started with the third book in the series because that was the only book that was delivered before we left on holidays. Matey loves having it read to him. Whilst reading to Matey, Princess was unusually quiet. She had made a short video clip of a story she had compiled using the “Toontastic” app that I had been able to download for free and which Matey’s speech assessment therapist had recommended as a great app for language development. After dinner, we sat and watched her short clip. I encouraged her to continue making up a new story and video clip each day of the holidays as it was great practice at compiling a story. She was able to explain to me the various parts that a story needs. We haven’t been able to get the tv to work in our unit (we haven’t properly tried), but that has been a great thing. 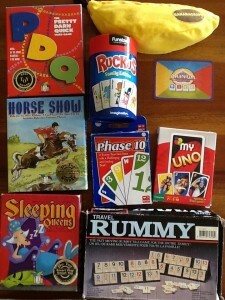 I brought with us nine different card or travel games and we have spent time each day playing them. Great for co-operation, teamwork, dealing with losing, strategy, maths, spelling etc. 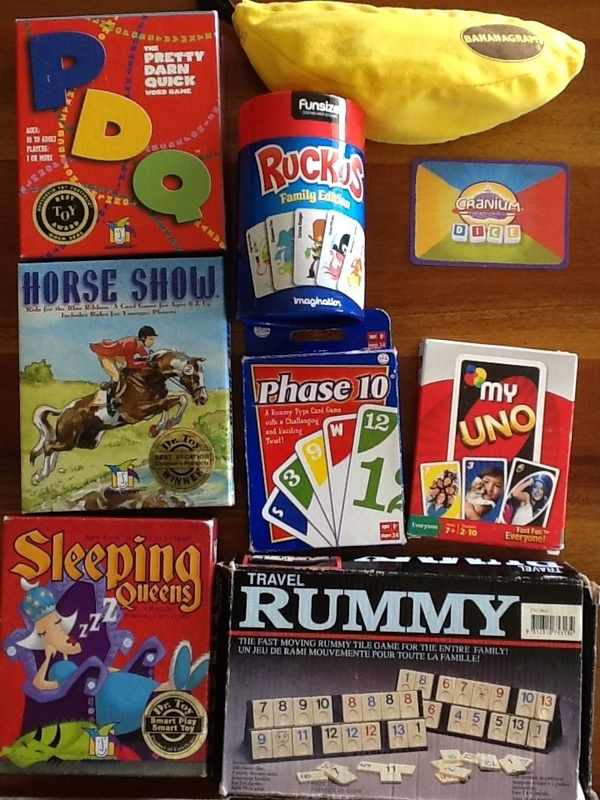 The games are: Horse Show, Sleeping Queens, PDQ (Pretty Darn Quick), UNO, Phase 10, Bananagram, Travel Rummy, Cranium Dice, and Ruckus. The whole family is getting right into the games and loving them. Ruckus has caused a few arguments so we have changd the word to “freeze” which is what we now say & do when we are out, thus deleting any arguments.